Play if: You want to conclude the Angmar Awakened cycle with a thrilling quest, you enjoy the dungeon delving aspect of the narrative, you want to fight off your own cards, you like difficult quests like this that include boss-battles and a sprint to the finish. What is different about this quest? : Reanimated Dead enemies, Sorcery attachments, Undead enemies, Sorcery synergy, having to clear all locations in play to win. Solo or multiplayer? : This scenario requires every player to be capable of defending for themselves, so I would say that lower player counts fit the scenario better. This way, you also reveal less Sorceries per round, making the boss-fight easier. This quest isn’t bad in true solo either, as long as your deck can quest hard enough to pass the first stage, and kill the enemies before they overwhelm you. More players will mean that more enemies will be revealed, and can also clog up the staging area with locations for stage 3, making it harder to reach the finish. Can I run side-quests for this scenario? : You can, though the longer you stall on one quest, the more Sorcery attachments are revealed. However, side-quests will allow you to get around some of those Sorcery attachments that attach to the active quest. This allows you to discard them more easily, making stage 2 easier for you as well. Since the second and third stage don’t require progress to be placed on the quest cards, side-quests seem appealing as well. Take note that you will have to do some trickery for stage 2 though, and clearing side-quests on stage 3 is what people like to call: a bad idea, since stalling there will damage characters. What to look out for? : Sudden engagement of enemies, Sorcery synergy, sprint to the finish, boss-enemy halfway through the quest. 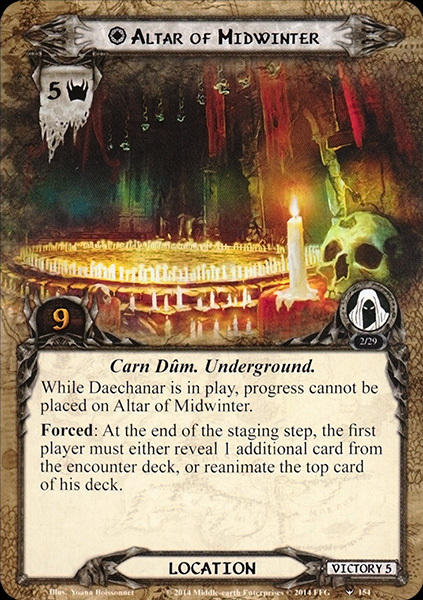 The quest starts off by removing the two unique cards in the encounter set: Daechanar and the Altar of Midwinter. These cards will be added to the game at stage 2, so save them for that time. Besides this, the players will first each reveal a card off the top of the encounter deck. Most cards will be troublesome to reveal this early, but there are a couple of easy cards in the encounter deck that can allow you to start off without much problems. These are the Dark Sorcery (gets rid of no allies, though Doomed 2 still goes off), Dead Lord (probably best to see early, with no enemies in the discard pile) and Possession (No allies in play yet). The rest of the cards will be more problematic, and will start you off at a disadvantage. Other than revealing 1 card per player, the players must also reanimate the top card of their deck. This means that they place the top card of their deck (before drawing their opening hand) face down engaged with them. The stats on these enemies will vary depending on what is in the staging area, but they are usually weak enemies that are more of an annoyance than a problem. With the quest starting you off with 1 enemy engaged from the start, Dunedain decks will have an advantage, starting their synergy early. With the final step of setup complete, the players will advance straight away to the flip-side of the quest card. This stage is where the players will likely spend the majority of the game. At this stage, the players should start to build up their board state and focus on getting enough attack power on the table to handle both the direct enemies in the encounter deck, as well as Daechanar as soon as the players proceed to the next stage. There are no forced effects or responses on this quest card, only a few passive effects. Players will have to remember that Reanimated Dead have twos for all their stats, including hitpoints. Once Reanimated Dead are defeated, players place the cards face-up in their discard pile, as if the card has just been discarded. For all other purposes, they respond just as normal enemies would, though they get buffed by the encounter deck with effects like Restless Evil and Dark Halls. The Reanimated Dead are not a real problem for most decks, but there are a lot of cards that bring these enemies out, making them more of a Swarm style enemy. There are ways to avoid reanimating cards, such as drawing through your entire deck quickly with Noldor or Mining decks. If a treachery like Death and Calamity cannot find cards on top of your deck (since you drew through your deck or discarded it) then it will not reanimate any cards. The same is true for cards that reanimate allies you played. If you are not chumping often, then you can avoid the majority of the reanimate effects. The other big thing at this stage (or actually in the entire scenario) are the Sorcery cards in the encounter deck. There are a lot of them, and they have a variety of effects, none of which seem to be beneficial, unfortunately. In total, 7 different Sorcery treacheries and attachments are in the game, with a total of 18 cards in the encounter deck. This makes your chances roughly 40% on revealing a card with a Sorcery trait. The deck tries to amplify this by having certain cards pull out more Sorceries. While this stage doesn’t really interact with them, they will add additional passive effects to either the quest card, or to characters in play. Note that the main quest card will require you to transfer all Sorcery attachments attached to it over to stage 2B once the players have completed this stage. In order to get rid of the Sorcery attachments a little earlier, players can either go up against side-quests, or bring cards that remove Condition attachments, since most of the Sorcery cards also have that trait. You will want to go to the next phase with as few Sorcery cards in play as possible, even if that would take you an extra turn. The quest requires 18 progress to complete, making players stay at this stage for a while. During this time, they can build up their board state and try to clear the staging area a little. Once the final progress token has been placed on the main quest, the players immediately advance to stage 2. Remember that all Sorcery cards attached to the quest card will go with you to the second stage. You know a stage will be important when it has the name of the cycle as its title. Stage 2 is where you will face the final boss of the cycle, the wraith commanding Thaurdir and in charge of Angmar during this time. To start off, the players will have to add the Daechanar enemy to the staging area. His 5 threat will soon leave the staging area, so players shouldn’t be too worried about that. The unique Altar of Midwinter location will become the active location, returning any other location to the staging area, if needed. Since the scenario just loves those Reanimated Dead, each player will have to reanimate the top card of their deck. This means that one player will be engaged with at least 2 new enemies this round, as Daechanar’s engagement cost is only 1. The B-side of the quest card is not very interesting, as it only informs players that Reanimated Dead are still 2/2/2/2 enemies, unless their stats get boosted by other encounter cards. The quest card cannot be defeated while Daechanar lives, so killing him will be the goal at this point in the quest. This is easier said then done, as Daechanar is a fearsome foe that gets boosted by his own magic, and has impressive base stats to begin with. While Daechanar is immune to attachments, he is not immune to player card effects. This means that players will be able to cancel his attacks, and can target him with other abilities and events. This is important, as it opens up a good strategy to kill him. At this point, the Sorcery cards you earned last stage will become more important. 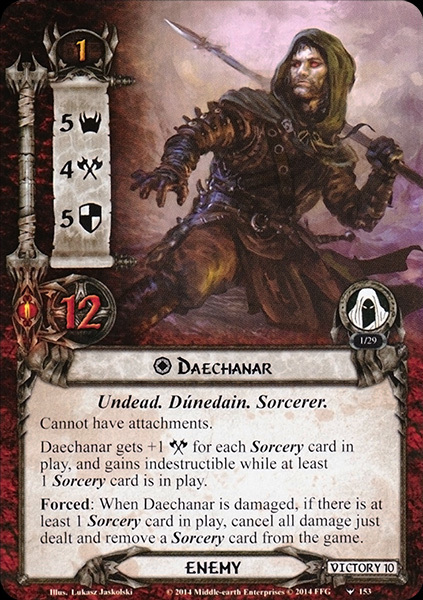 Daechanar gets a +1 to his attack stat for each card with the Sorcery trait in play, as well as the Indestructible keyword as long as there is at least 1 Sorcery card in play. Since you must defeat the Sorcerer to pass the stage, you must find a way to get rid of the Sorcery cards. Luckily, the quest helps you with that, so that players don’t have to continue running Condition removal cards. Whenever the players place any damage on Daechanar and there is at least 1 Sorcery card in play, the players must cancel all damage dealt to him, and may instead discard any 1 Sorcery card. This card will get removed from the game, so do not add it to the discard pile, but put it aside, out of play. This makes sure that the quest doesn’t become too long, as you can only reveal so many Sorcery cards from the encounter deck. The big strategy with Daechanar is to damage him as often as possible, in order to discard 1 Sorcery card every time you hurt him. With a base 5 defence, you are not often placing damage on him via traditional combat, so you must be tricky. There are a number of cards that can be great at pinging him for 1 damage, freeing up a Sorcery. Ranger Bow is an easy one, as well as Hail of Stones for only 1 damage, but note that these effects only trigger when Daechanar is in the staging area. When defending, Spear of the Citadel can remove a Sorcery card, but players could also use Swift Strike. Since the effects are apart from each other, players will be able to remove multiple Sorcery attachments from Daechanar. For the attacking crew, Bow of Yew is the obvious attachment to use, even if you cannot pierce Daechanar’s defence. Between all these cards, you should be able to get rid of a lot of Sorcery attachments during the round Daechanar enters play. This will allow you to start damaging him, as well as lowering his attack stat. Removing the Sorceries will also remove their passive texts, making the game a little easier. I find this battle to be very similar to that of the Morgul Vale against the Nazgul of Minas Morgul, though this enemy still has to be defeated after all the direct damage that was dealt to it. Once the players have removed all Sorcery cards from play, they can start chipping away at Daechanar’s 12 hitpoints. Direct Damage will again be a good strategy, but an all-out attack with your characters can also do a lot. Try to finish Daechanar off in one round though, as you may reveal more Sorceries in the next round of staging, providing him with a buffer you have to break through first. Once the final point of damage has been dealt to him, he is added to the victory display, and the players move on to the next stage. The boss-fight would be relatively easy if this was the only effect active at this time, but it is not. The unique Altar of Midwinter location is also in play now, and it will require you to quest hard, or use tricks around it. While Daechanar lives, the Altar cannot get progress tokens on it. Since it is the active location, it will not get explored, clogging up the staging area with other locations. The players also have to remember that the Altar will have a Forced ability targetting the first player. That player must either reveal an additional encounter card at the end of the staging step, or reanimate the top card of their deck. Scrying will be useful here, as players can usually reveal another encounter card with ease. However, if a Sorcery card is on top, then the first player should take the reanimate option. If you have no scrying, then the reanimated card is usually safer. Since the location cannot leave play without Daechanar being dead, the players must work around the Altar to avoid location lock. The players can easily swap the location with a West Road Traveller or South Away, returning the Altar to the staging area. While this adds 5 threat to the staging area, it frees up the active location slot, allowing players to travel and to clear locations. Players can also go a different route, playing Path of Need on the Altar, as well as a Woodmen’s Path. Path of Need in particular is a great card to use, as it frees up a lot of characters who can then repeatedly attack or defend. This allows you to clear the board of smaller enemies, and allows you to quest with all characters. It also circumvents the A Fell Dread treachery, freeing up that hero for combat. The Altar’s 9 quest points make it a great target for Woodmen’s Path, which will make the next stage easier. With Daechanar dead (or more dead than he already was), the players now have to escape the catacombs of Carn Dum. But with the catacombs collapsing on themselves, this will not be a casual stroll to the exit. Once this stage is revealed, the players must make sure that there are at least X locations in the staging area, where X is the number of players. If there are not enough locations in the staging area when the players arrive at this stage, they must search the encounter deck for locations and add them to the staging area. The decision on which location to pick comes down to your board state. If you are able to clear all locations in the staging area in one swoop, then go for the Sinister Dungeon. Yes, the location will drag out a Reanimated Dead, but if you quest hard enough, you don’t have to care for combat anymore. Tombs of Carn Dum and Dark Halls are also decent options, but will require more progress to clear. The B side of the quest card now has a lot of effects on it. To start off, Reanimated Dead are still 2/2/2/2 Undead enemies, with nothing new going on. What is new, is that progress that would be placed on the main quest, can be placed on locations in the staging area. You may divide the progress as you like, exploring some locations, or putting them in range of location control cards. The players will win as soon as they have explored all locations in play, both as active location and in the staging area. However, as long as there are locations in play, the players cannot win, and must resolve the stage’s Forced effect at the end of the quest phase. This effect will deal 1 point of damage to every character in play, making it essential that you clear this stage as quickly as you can, as your heroes will likely be damaged already. This damage will also start to chip away at your allies, making it harder to quest over the threat in the staging area. In order to clear all locations and to win the game, use a Woodmen’s Path on the Altar of Midwinter. That frees up 8 point of progress that can be distributed elsewhere. The other locations can also be targeted with location control cards, so try to clear them in the staging area as well. Careful distribution of the progress you made will likely clear the locations within a turn or two, ending the game. The best bet at this stage is also to go all in on questing. This includes using effects like Untroubled by Darkness and Scouting Party to boost willpower on your characters. If you can go all in and make a ton of progress, you can clear this stage in one go, escaping the dungeons and winning the game. Once all locations are explored, and there are none left in play, the players win the game and have completed the Angmar Awakened cycle. This allows progression players to move towards the Grey Havens, and the many ships that lie there waiting for them. Average threat on cards revealed is 1.4 threat per card. This is due to the high concentration of Treachery cards in the deck. There are a couple of 4 threat cards in the encounter deck, so it is a rough estimate. 7 cards can potentially surge, but there are other When Revealed effects that will draw out more enemies or more encounter cards. The Doomed keyword is only present on 4 cards, making it less of a problem. The quest doesn’t have a lot of threat raising abilities either, making it a decent quest for Doomed cards of your own. Remember that high threat costs will force more enemies to engage you. The chance to reveal Sorceries is 40% in Normal mode and 35% in Easy mode. In Easy mode, some of the more nasty Sorceries are removed, but the concentration remains about equal. Daechanar cannot have attachments and is indestructible while at least 1 Sorcery card is in play. As can be seen from the graph, the spread of cards is relatively equal, with a slightly higher concentration of Treacheries. Remember that the Reanimated Undead are not part of this chart, which would increase the amount of enemies in the encounter deck significantly. The Undead of Angmar are here at their strongest. On top of the regular Undead that you have faced during the cycle, there are now also Witches, Sorcerers, and even more powerful spirits that will hinder you. On top of these, the scenario also includes the Reanimated Dead, making you face your own cards as allies too. The number of enemies in this scenario can get out of hand quickly, so you’d do best to prepare for combat. Reanimated Dead: These enemies will be the bulk of your opponents army, besides the swarmy Cursed Dead. There are various effects on treacheries and quest cards that will put out these Reanimated Dead, so you must always be ready to at least defend them. The Reanimated Dead are Undead enemies with 2 threat, 2 attack, 2 defence, 2 hitpoints, and an engagement cost of 0. These stats can get boosted if multiple copies of Dark Halls are in the staging area. Since these enemies are more of a nuisance than a problem, they can be easily defended by characters like Beorn and the Vigilant Dunadan who don’t exhaust to defend them. Killing the Reanimated Dead can be troublesome, as not many characters have 4 attack right out of the gate. Get some weapons on characters to make it easier to kill them with just one character. Once you have defeated the Reanimated Dead, they go to your own discard pile. Daechanar: I have talked in length about how to best get rid of his Sorcery attachments, which opens up the chance to kill Daechanar. His 5 defence will be tough, but remember that Daechanar isn’t immune to player card effects. You cannot attach any attachments to him, but he can be targetted by any event that doesn’t require a non-unique enemy. This opens up a host of Direct Damage effects, which can circumvent his high defence. It can also cancel his attacks, which might save some characters in the early rounds of him being in play. Once you defeat him, you must move on to stage 3. Dwimmerlaik: Using the same art for the cover of this pack was a good idea, this guy looks very wraithy. 4 threat will make it a tough card to reveal during staging, potentially losing out on some much needed progress. The Undead enemy attacks for 5, which is pretty brutal. Chumping this attack will not be a smart thing to do, as the Forced effect on the Dwimmerlaik will reanimate that character, and deal it a shadow card. This means that your ally will be raised from the dead and immediately fight you. Try to block this enemy with a built up defender, saving your chumps for Reanimated Dead. The most outstanding thing about this enemy is its 0 defence. This opens up Straight Shot right away, which is the perfect way to discard this nasty enemy. Otherwise, the players will have to fight through the Dwimmerlaik’s 9 hitpoints, which can be a slog at times. Feel free to slowly but surely destroy the Dwimmerlaik with a couple of non-combat allies as well, as even an ally with 1 attack can do a point of damage to this enemy. Witch of Angmar: She is just the word “King” away from being one of the most brutal enemies in the game. Luckily, this witch is not royalty, and therefore much more manageable. Her stats are a bit all over the place, but a low engagement cost of 26 will mean that you will have to face this enemy quickly. When engaged, the players must be careful with the shadow cards dealt to this enemy. The Witch of Angmar will first trigger any shadow effects on the cards, if any, and will then trigger the effect of any card dealt to her with the Sorcery trait. This does not include the Wraith of Carn Dum, as the card itself does not have the Sorcery trait, only the potential attachment. For the Witch, it is a good thing to discard her shadow cards before they trigger. Armoured Destrier or Jubayr are good cards for this, but you can also use Dawn take you All or Shadows give Way to help discarding other shadow effects as well. If you are unsure if you should discard the shadow card, use Silver Lamp on a character, that way you know for sure what effect will trigger. Note that cancelling the shadow effect will not cancel the fact that the dealt card was a Sorcery, so Burning Brand and Hasty Stroke cannot cancel the Forced effect on the Witch, the card was still dealt to her. 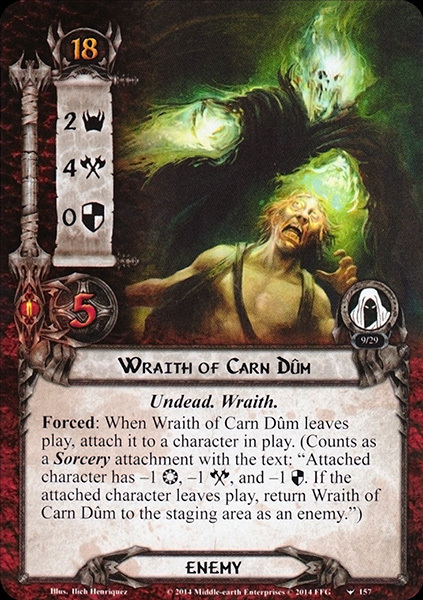 Wraith of Carn Dûm: Another 0 defence enemy, but with a very low engagement cost of 18 this time. The Wraith seems like a weaker version of Dwimmerlaik, but doesn’t have the same ability as it. Instead, once the Wraith of Carn Dum leaves play, it will attach to a character in play. That character gets a static debuff of -1 to all stats. Since this attachment counts as a Sorcery, the players will have to discard it for Daechanar come stage 2. In order to reduce the damage of this enemy, the players can attach it to a utility ally like Master of the Forge, who doesn’t rely on stats for its usefulness. Having the enemy attached to a character will also remove it from the rest of the game, so it can’t be returned to the staging area unless the attached character leaves play. Make sure that you either keep the Wraith engaged (Forest Snare works wonders with him), or that you keep the attached character alive for the rest of the game. Once you have the option to remove a Sorcery attachment, the Wraith will be placed out of play. The locations of the quest are important for the final stage, but that doesn’t mean that they can be ignored in the earlier stages. It will be in your best interest to explore as many locations as possible. This allows for a quick escape and for less buffs to the enemies. Altar of Midwinter: That many candles lit at once must be a fire hazard. Who was the orc that lit all those candles in the first place? I have talked about this location already, but let me summarize the strategy on this one. The important thing to note is that the Altar is not immune to player card effects, allowing you to swap it out of the active location slot. If you leave it in, consider attaching Path of Need on it, to make the second stage a lot easier. When exploring the Altar, you may run into some problems with the 9 quest points. Having a Woodmen’s Path on it will save you a lot of progress, which can then be distributed to other locations. 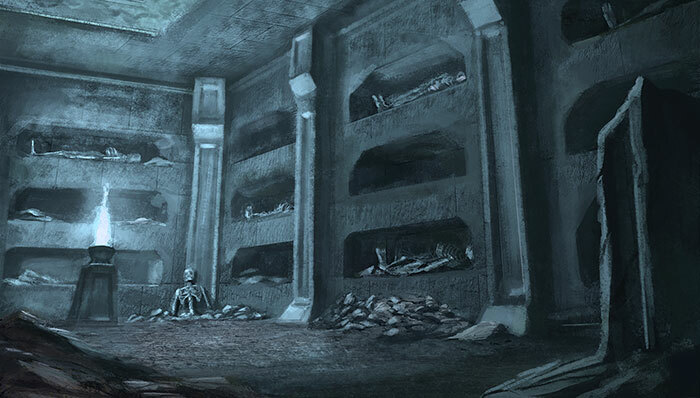 Unholy Crypt: While it is the lowest base threat of any location on this list, this location will be the toughest non-unique location on the list, especially in multiplayer. The Unholy Crypt gets +1 threat for each Reanimated Dead in play. With 4 players, this location can easily become a 6 threat location or more, depending on the player’s capability to kill their Reanimated Dead. The best tools for this location are Thror’s Key (blanking the text box to make it a standard 1 threat location) or travelling to the location once you equip it with a Woodmen’s Path. This cuts down the 7 progress required to clear the location to 1, saving 6 progress to go on the quest card. Once multiple copies of this location are in play, you should really start to kill Reanimated Dead enemies engaged with players. In true solo, this location can usually be ignored, as other locations take priority during the travel phase. Dark Halls: This location is probably the easiest location in the quest, as it only has 2 threat and 4 quest points. However, this makes it so that you will want to travel elsewhere, to a location with more threat. This creates a problem, as the Dark Halls provide a passive buff to Reanimated Dead with +1 attack and +1 defence per copy of Dark Halls in the staging area. Since the Reanimated Dead are a common sight in this quest, you will want to explore these locations rapidly, and not have them stuck in the staging area for long. Since there is no travel cost, I will advise to prioritize this location if there are a lot of Reanimated Undead engaged with players. That buff can make things nasty real quick. Exploring this location in the staging area isn’t too difficult, as 4 points of progress can be placed here with various effects. Sinister Dungeon: On the other end of the threat/quest point spectrum, we find this Underground location. The Sinister Dungeon has a massive 4 threat, but only requires 1 progress to clear. With it not being immune to location control cards, this may seem like a perfect target to get rid of in order to make some more progress. However, the card was designed with that in mind. Once players explore the Sinister Dungeon, the first player will have to reanimate a random card from their hand and deal it the Dungeon as a shadow card. This is nasty, because it not only adds an enemy engaged with the first player, but that enemy will also get 2 shadow cards, with one of them being the Dungeon. 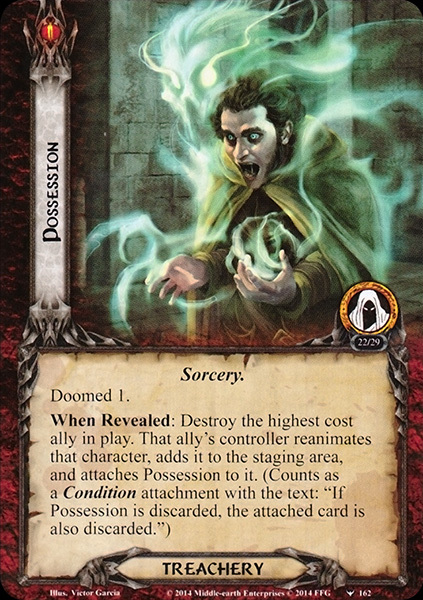 The shadow effect of the Sinister Dungeon will require the player to discard the top 2 cards of the encounter deck and resolve any When Revealed effect on Sorcery cards discarded this way. This can either thin the deck of enemies, or bring out more Sorceries outside the staging step of questing. This is bad during stage 2, and should be avoided. In order to circumvent the Sinister Dungeon, players can use effects like Heirs of Earendil. This discards the location instead of exploring it, making it not trigger its Forced ability. Distant Stars can do the same thing, and can allow you to swap the location with another location of your choice, preferably the Tombs of Carn Dum, in order to avoid the Travel cost. Players can also explore the location when the first player has no cards in hand, or they can simply play Hasty Stroke to cancel the shadow effect on the Dungeon. Tombs of Carn Dûm: Our final location of today only appears in the Normal mode of this quest, and is a 3/3 location. 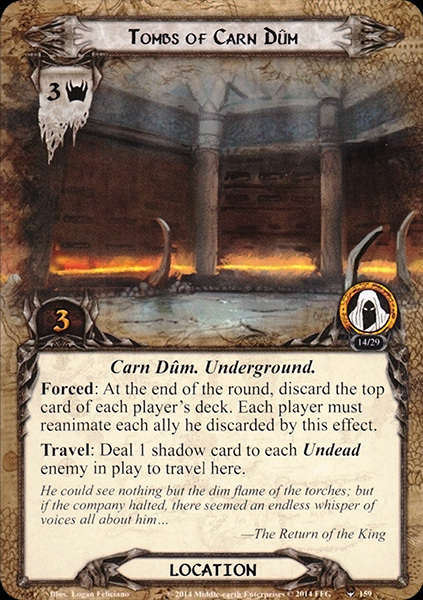 The Tombs have a passive effect that requires players to discard the top card of their deck at the end of the round. If they discard an ally through this effect, they must reanimate it. This effect goes off around 40% of the time in standard decks, but you can reduce this by not bringing a lot of allies in the first place. You can also thin your deck of allies with cards like The Eagles are Coming and Ent-Moot, removing allies from your deck, preventing them from getting reanimated. Remember that having multiple copies of this location in play will force the effect to stack, discarding up to 3 cards at the end of the round. This can bring out a lot of enemies, so players should focus exploring these locations when they can. At 3 quest points, the Tombs can be explored easily by a location control deck, but players might also want to consider travelling here if they have no other options. This will force the players to deal a shadow card to each Undead (read, each) enemy in play. This can be a way of getting rid of some Sorcery cards, but will also make enemies tougher, so it is your choice to travel there yes or no. If the board is relatively clear of enemies, players can be motivated a bit more to travel here. Note that the Forced effect will still trigger once the location is active. While only 3 new treacheries appear in this scenario, they do appear a lot. All three of them are Sorceries, further amplifying the synergy between them and the quest. You will want to bring a lot of cancellation, as most of these treacheries are very nasty and will make it very difficult to win. The other treacheries in the scenario have been encountered before but will get mentioned if they are important to the synergy that the quest tries to create. Possession: Sometimes, the game just hits the theme just right. That is the case with this Sorcery that first of all raises the threat of each player by 1. Then, the highest cost ally in play will be reanimated and gets Possession attached to it. The now new enemy gets added to the staging area, from where it will engage during the next engagement phase. The Reanimated Dead have an engagement cost of 0, so you are bound to engage it sooner rather than later. The Possession attachment will count as a Sorcery card in play for stage 2 and will discard the ally once the Sorcery has been removed. Players can also kill the Reanimated Dead and discard the card that way. In the end, there is no way to regain your high cost ally, unless a player cancels the When Revealed of this card. This treachery only appears in the Normal version of the quest, and is great to have as a Shadow card. Bonus points for the art! Death and Calamity: And subtract those bonus points for the art here. This looks like some Eldritch Horror stuff, with the exact face of me when I step into a puddle wearing only socks. The treachery is also a Sorcery, which will attach to the current quest card. 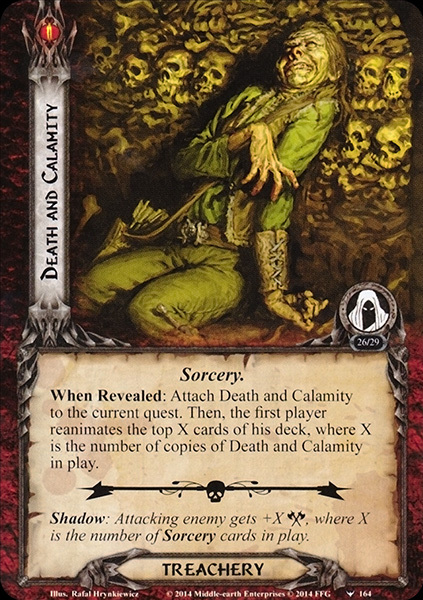 When attached, it will force the players to reanimate the top X cards of their decks, where X is the number of copies of Death and Calamity in play. This means that it doesn’t matter if they are attached to different quest cards! With a total of 4 copies in the encounter deck, this card can potentially bring out 16 enemies at once, which should be enough reason to cancel the effect. Even in the early game, this treachery will hurt your board state by bringing out an enemy for each player. The best bet is to happen to be questing against a side-quest, and exploring that side-quest soon after you reveal this treachery. This will discard it, leaving you with 1 less copy to worry about. A Fell Dread: This is by far the worst card to reveal early on in the game, as it reduces your willpower and will probably leave a hero incapacitated for a long time. When this Sorcery is revealed, the player with the highest threat will attach this card to a hero that hasn’t got a copy of A Fell Dread attached already. When attached, the hero must commit to every quest, but gets their willpower reduced to 0. This means that players can attach this to a hero who can ready afterwards, or doesn’t have to exhaust to quest. This can be useful for Noldor/Silvan heroes who have Light of Valinor attached to them as well. This still leaves the hero ready for combat. In true solo, this card hurts the most, since multiple copies will eventually neuter your heroes. Cancellation is advised, or players can wait until all copies are revealed, and then play Power of Orthanc to remove them, since they are still Condition attachments. Readying abilities on the heroes is also nice to have, but only if the heroes are useful outside the quest phase. The scenario doesn’t have a new side-quest for you to keep track of, but only uses the two found in the encounter sets. These have been encountered before, during quests like Treachery of Rhudaur and Deadmen’s Dike. Seal the Tomb: Like in the previous quests, this side-quest will throw more Undead enemies at you at the end of the round. As a bonus, the side-quest will discard 3 cards from the top of the encounter deck, potentially getting rid of some nasty Sorceries. Clearing this side-quest will be of value, as you will have less enemies to worry about. 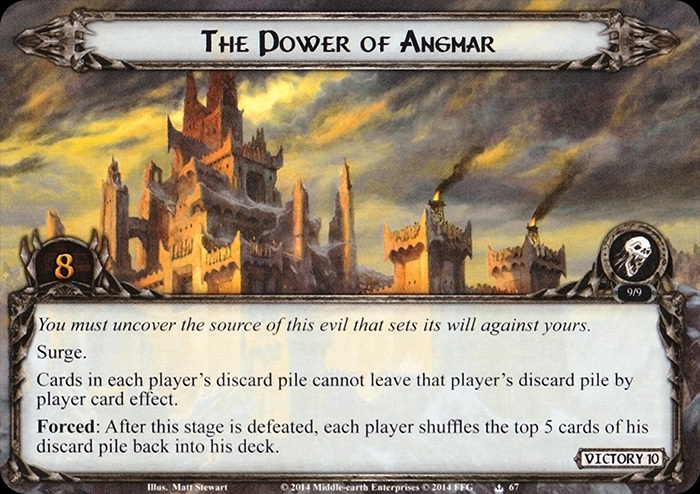 The Power of Angmar: Unlike Deadmen’s Dike, there isn’t really anything interacting with your discard pile. This makes the side-quest a bit of filler, and not really a big threat. However, if you want to retrieve your Reanimated Undead cards from your discard pile, you will have to clear this side-quest. This not only grants you access to your discard pile again, but also allows you to shuffle the top 5 cards from your discard pile into your draw deck. This allows you to save some cards that were reanimated, and potentially draw into them eventually. If you don’t care for that, and are not playing a deck that interacts with their discard pile, just let this side-quest sit in the staging area. Bring Condition Removal! I cannot stress how important those cards are in this scenario. Most of the treacheries and even some enemies will attach to your characters or to the quest card, making it harder for you to move on and to eventually kill Daechanar. Using condition removal cards wisely will remove them to the discard pile, making the quest a bit easier since you no longer have to keep track of 10.000 passive abilities all the time. Let at least one person play Ally Elrond, as his effect lets each player pick a Condition to remove. Power of Orthanc is also a solid pick. Treachery cancellation and the cancellation of shadow effects is also important, as a number of these can really make the game a lot harder. Not only will you likely remove Sorceries from play, but you will also save some willpower or some allies. There are multiple targets for these cards to work well, so be sure to bring a lot of cancellation. Direct damage is the key to defeating Daechanar and getting rid of as many Sorcery attachments. Try to ping him for a point of damage before he attacks, as the number of attachments also dictates his attack strength. Save your Direct Damage for the final attack as well, as there can be cases where new treacheries are revealed, giving Daechanar a buffer again. Straight Shot is just a wonderful, wonderful card in this quest. With it, you can discard enemies like the Wraith of Carn Dum and the Dwimmerlaik from play without needing anything else (besides the Weapon to exhaust of course). This allows you to focus combat on the other enemies, without being distracted by these two. The event can also work on other enemies, but those require some more setup in order to be eligible targets. For stage 2, it is great if you can play a Path of Need on the active location. While this attachment is costly, it will allow your heroes to be ready for both questing, defending, and attacking. This boost in action advantage allows you to dispatch enemies quickly, as well as making sure that you can overcome the threat in the staging area. Dunedain players will love this quest, as it forces you to engage a lot of enemies. This in turn activates their synergy, making their allies better and their events more powerful. You even start off with at least 1 enemy engaged with you, so you can reliably run heroes like Amarthiul and Halbarad for their bonuses. All locations in the scenario have the Underground trait. This gives Dwarf decks a natural advantage against the locations, and makes them easier to play. Try to run Untroubled by Darkness for big quest pushes towards the end of the scenario. All enemies in this scenario share the Undead trait, so they are vulnerable to effects like Mighty Prowess. It also opens up Rossiel for this quest as a decent defender. Chumping is not really a viable strategy in this quest, as it will likely cause that character to be reanimated and fight you. Make use of some defensive heroes for the tough enemies, while keeping defenders like Vigilant Dunedan back to deal with the Reanimated Dead. The quest is not very popular with the community, so most playthroughs are with decks up to the pack itself. These links should provide some useful footage to see how the quest plays out in any number of players. While the narrative of the cycle ends with this pack and moves on to the Grey Havens, I skipped a couple of scenarios and will go back to do those before concluding this cycle and moving on to the next. 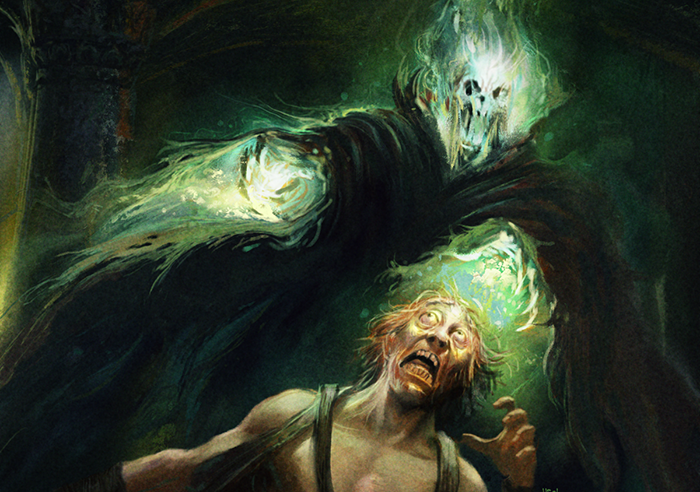 Stay tuned for more Undead fun, as we tackle Treachery of Rhudaur.